Some people may take one look at their older and scratched floors and think they should be completely replaced. The truth is, with some simple work like sanding the floors it can entirely rejuvenate them. If you’re finding that hard to believe, take a look at a recent job we did at Moggill Road in Kenmore. Before DR Main Floors worked on it, you can see the floors were severely discoloured, grimy, and appear to have permanent scratching. The timber is a traditional brush box but previously had a number of floor coverings. The floor coverings can make the renovations slightly more difficult because it leaves the residue of the various paper and glue backings, hence the discolouring of the floor. Floors that have been previously covered using this type of glue or residue take a lot more effort to restore, than ones free of it. In the picture, you can see the machinery we use that applies a very course grade of sandpaper. When the floor is sanded at a 45-degree angle, the green residue on the surface of the floors can be cut through. Because of our specialist machinery and comprehensive experience, the job took just three days to complete. This also included all the nails being punched and puttied because the floor had never been sanded before – so we were definitely starting from scratch! 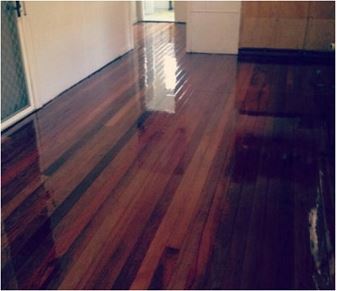 It’s evident in the photo, but even more so in real life, that the floor experienced a stunning transformation. The nice grain of timber is now visible, along with a beautiful gloss finish. 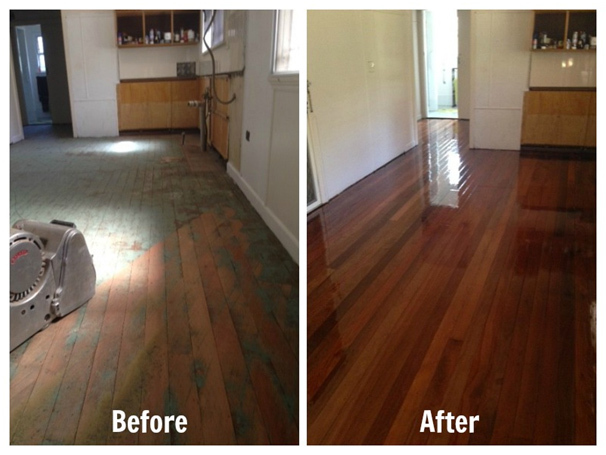 If you have timber floors that have previously had floor coverings, leaving an unwanted residue, then please get in touch with DR Main Floors.